Steel fencing can be a great way to protect any property and ensure a safe perimeter but the fencing itself doesn’t come cheap and can range from few hundred to a few thousand pounds depending on the size of the area you want to enclose and the quality and height of the fence you want to use. Steel fencing prices can also fluctuate depending on the trends and market value of steel at the time and unforeseen circumstances can always affect the price. In the following we delve a little deeper into exact types of fencing and steel fencing prices to make sure that our readers have the right information to get the best possible deal for themselves. We also look into the places that sell this type of product. The garden factory has a great choice of online steel fencing types for residential gardens and other smaller properties and areas. A lot of the steel fencing that the garden factory has to offer can be part of brick walls (usually sitting in-between and on top off). This not only adds an extra layer of protection but safeguards from elements that can pass easily between steel fencing bars such as rubbish and other unwanted objects that could, with the winds help, blow into your garden and make a nice one look like a rubbish tip. For a section of steel fencing the price can be from around £100 to £150 per six foot section and around £35 - £50 for a three foot section. The variations in price do depend on the style and the height and length of the product. The garden factory does also offer the chance to choose exact measurements to fit specific requirements for its clients. The steel fencing price does include installation and a coat of gloss finish to keep the steel fencing lasting as long as possible. 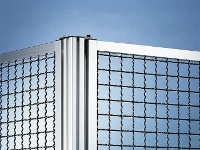 Mesh direct is a company that deals primarily with mesh steel fencing and ensures a good range of product for that specific type of steel mesh fencing. Mesh fencing itself has a wide range of uses for residential gardens and agriculture uses as well. A very popular use is for dogs, cats and other domesticated animals that give them the freedom to run free in the garden areas without fear of them running into traffic or just getting generally lost. Another popular use of mesh steel fencing is to keep livestock, such as chickens, into a closed area while still being able to keep a watch out and it also can safeguard against wild animal attacks, such as foxes, who will always try to rob one of your juicy chickens if you’re not careful. The variety is far greater here as is the uses and the size so the steel fencing prices vary a great deal but to give you some idea here are a few examples. Dog fencing, 15m by 1.2m, is £60 per section and poultry netting, which is 100m x 1800mm high, is £150 per section but again it depends on the use.